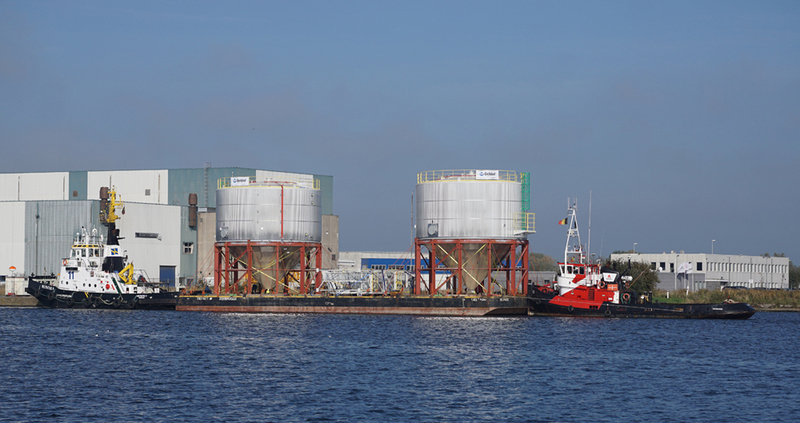 Today, two off-site constructed storage tanks are on their way to Ijmuiden, The Netherlands. They left the port of Ostend, Belgium yesterday and will arrive this evening its destination, where they can be unloaded the day after and later on installed on site. The storage tanks were built for Tata Steel in Ijmuiden, The Netherlands. They entrusted us with the order for a full scope project of replacing an existing tank for separation of tar and water by an improved process, consisting of two storage tanks of 900 m³ and one condensate tank. The project contains the civil works (bund wall and tank concrete support structure), the tanks and all ancillaries (stairs, walkways, …), including E&I and tracing.